﻿ Expanded Graphite sheet reinforced smooth SS304 - China Expanded Graphite sheet reinforced smooth SS304 Supplier,Factory - Cixi Aiflon Sealing Materials Co.,Ltd. Aiflon Pure Expanded graphite sheets are made from high purity flexible expanded graphite without fibers,binders or other additives. 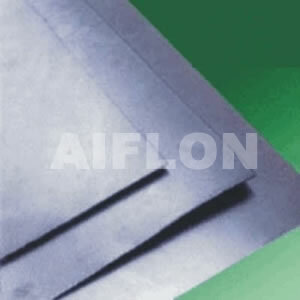 it offers excellent sealing capabilities such as thermal stability,shlf-lubrication,corrosion resistance,without being brittle and aging etc.,under extreme conditions with a longer life and less maintenance.Aiflon graphite sheets are available as homogeneous,reinforced by metal mesh,foil or tanged metal.Allsheets can be easily cut using conventional steel rule dies,utility knives or other simple gasket cutting equipment. GS 4000(R) Expanded Graphite Sheet/Roll GS 4002 Graphite Sheet Reinforced with smooth metal GS 4004 Graphite sheet reinforced with Tan ged metal GS 4006 Graphite sheet reinforced with metal mesh. Made for various gaskets,used in petrochemical,mining. vessels,bolibers,piping and duct,pumps and valves.flanges etc. Suitable for stema,mineral oils,heat transfer oils,hydraulic oil,fuel,water,seawater,freshwter etc.